Dr. Peter G. Hill (Weston) - Book Appointment Online! Choosing the right Chiropractor is an important choice to make. 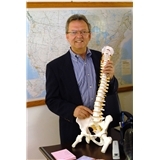 Dr. Hill and his staff are trained on the latest chiropractic treatments & technologies. Dr. Hill is excellent. He has a great bedside manner, and was very informative and thorough! The office is welcome and comforting... And so was Dr. Hill !! ?